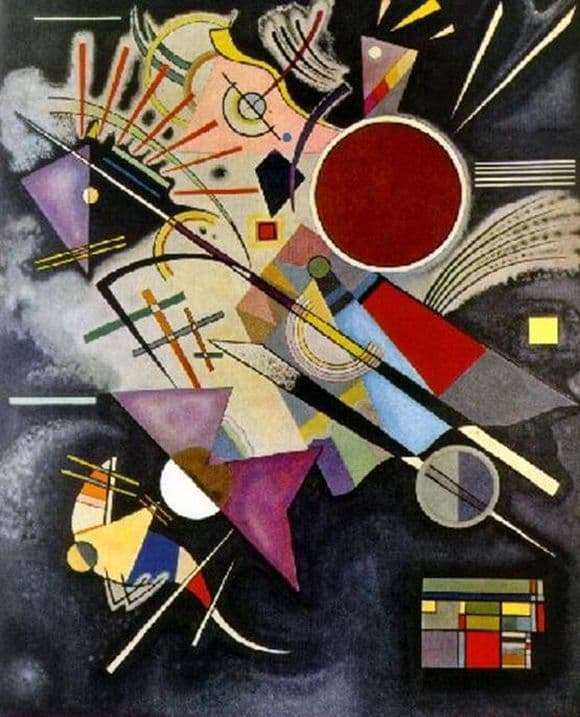 Vasily V. Kandinsky – Russian painter, founder of abstractionism. The talent for drawing he opened only 30 years after becoming acquainted with the work of Monet “Haystack.” Up to this point, Vasily, having received a law degree, becomes a teacher. A little later, Derpt University invites him to work as an assistant professor, but Kandinsky refuses. The future artist several times changed his place of residence, choosing between Russia, Germany and France. As a result, Kandinsky received French citizenship and brought his wife with him. As an artist, Vasily Vasilyevich visits many exhibitions around the world, teaches painting lessons and improves his skills under the guidance of the best masters of his time. Subsequently, Kandinsky develops an innovative concept of the rhythmic use of color in painting. In his work, he singled out the main line for creating abstraction works that were widely popular among the public. The painting “Black Accompaniment” was written in 1924. There are various kinds of geometric shapes, “superimposed” on each other. The work is filled with an unusual combination of bright and catchy colors on a black blurred background. The artist loved to play with the imagination of the viewer, selecting the most different forms of images and colors. Thus, he acquainted society with his unusual vision of the environment, which became a real sensation among critics-aesthetes who managed to find some meaning in his works. Kandinsky operates on a combination not compatible. In his canvases you can see the abundance of sharp forms and fancy colors. The specific work of the artist did not become one of the most popular paintings, but she found her viewer in a series of canvases devoted to the aesthetics of geometry.